Increase your productivity with a dump truck liner! Wiegand Liners sells and installs HMW and UHMW plastic dump truck liners for many applications. We have installed liners in Indiana, Iowa, Missouri, Illinois and all over the Midwest. Customers have driven over 300 miles to get a Wiegand installed liner. The most common applications for our liners are dump trailers and dump trucks, although belt trailers, hopper bottoms, vans, utility trailers, off road vehicles and loader buckets can also be lined. 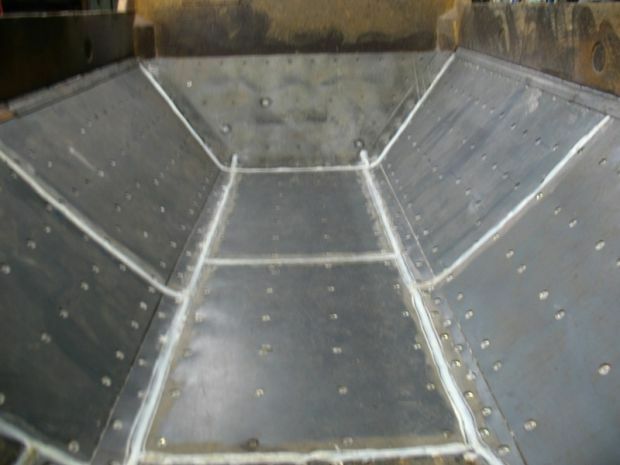 We also offer repairs on plastic tanks and applications with our plastic welder. If we have installed a liner for you in the past, you acknowlege the value a liner can bring in terms of low maintenance, wear and ease of dumping. If you're considering purchasing a liner for the first time please don't hesitate to give us a call and we can discuss your specific application and address any questions you may have. Wiegand Liners is the leader in the lining of dump trucks and trailers. Weigand Liners was created to fill a need, both commercially and personally. Wiegand Fertilizer Service was tired of having lime freezing and sticking to their trailer, leading to the installation of a 28’ dump trailer liner in September of 1991 that provided fast and complete release of the lime from their trailer, regardless of the temperature. Other truckers soon observed the benefits of this liner and expressed their own interest, creating a sideline business for the Wiegand family. In 1996, Steve and Mary Ellen Wiegand sold their fertilizer business to focus solely on the sales, installation, and repair of dump truck liners. Today, Wiegand Liners is a QuickSilver dealer for Illinois, parts of Iowa and Missouri. We have installed over 2,500 liners and our experience and knowledge of the installation process remains unsurpassed. • Releases load 1-2 stages sooner, giving you a possible extra load per day. • Dumps cleaner with little or no carry back, eliminating end-of-day clean-out. • Eliminates use of release agents. • Insulation value reduces loads freezing to the floor in cold weather. • Makes you more serviceable for additional employment. • Reduces the risk of a tip over, because load breaks loose from the liner 1-2 stages quicker. • Prevents floor wear on new trailers. • UHMW will out-wear aluminum 2-to-1 and will wear equally to steel (typically lasting 6-10 years with average usage). • Can be installed over thin or wavy floor instead of re-flooring. • Reduces overall maintenance cost on trailer and drive system. • Typically adds $1000-2000 to resale value of trailer. "We run 20 – 39’ end-dump trailers. We haul grain, coal, sand, and rock, so contamination is a big issue for our trucking company. We feel the best installation of liners has come from Wiegand Liners. These liners are better than any liners installed by the trailers’ manufacturers. There is no comparison to the Wiegand Liners installation. We have a factory floor liner that lasted less than 4 years. We have an original liner installed by Wiegand Liners in 1998 that is still workable and usable today. Steve recently did an installation on a new trailer; the trailer is empty by the time the trailer gets to the 3rd stage of the hoist. Wiegand Liners are the best!" Increase your productivity with a dump truck liner! Wiegand Liners sells and installs HMW and UHMW plastic dump truck liners for many applications.